Roald Dahl’s BFG is one of the most memorable characters in children’s fiction and this (reportedly) is Dahl’s favourite of all his books. The story tells of Sophie, living in an orphanage, who is snatched from her bed one night by a giant who takes her far away. Fortunately for Sophie, this is a kind and friendly giant who spends his days catching dreams and his nights blowing them into the bedrooms of sleeping children. The other giants are not at all friendly however and when Sophie finds out they are planning to steal children from their beds in England and eat them she hatches an urgent plan. Sophie and the BFG, with the help of the Queen, save the day. The evil giants are captured and their punishment is to eat a diet of disgusting ‘snozzcumbers’, until then the BFG’s only food. This is an exciting adventure story set in an imaginary magical parallel world where dreams are created. The story is, at times, scary but full of humour, sadness, acts of bravery and friendship. Moral dilemmas such as the difference between stealing and borrowing provide plenty to talk about, as does ‘Gobblefunk’ the BFG’s made up language which is great fun, ‘scrumdiddlyumptious’ in fact! The latest edition illustrated above includes a cover image from the 2016 Spielberg feature film, an introduction by Dahl’s daughter Lucy and a list of characters. Which bits of the story did you like most? Did any scene stay in your mind? Which part was the funniest, scariest, saddest or most exciting? Talk about dreams and what you remember of them, what ‘ingredients’ would your child like to mix to make a lovely dream? Talk about the BFG ‘borrowing’ a book for fifty years, should he have done this? Make a zig zag book together. Children can draw the main characters from the story in it, add labels and notes about each character. Children could use a notebook or make a sewn book to list some of the BFGs words and phrases in his special language ‘Gobblefunk’ and write what they mean. They could do this as they read the book or go back to the book when they have finished to collect words. Give children an empty plastic jar or bottle so that they can try ‘mixing’ a dream. They could do this for example, by colouring cotton wool with paint, see here for ideas. When they have finished children can make a label for their dream jar . Collect some old clothes so your child can dress up like the BFG. You could make big ears together and a cardboard tube trumpet. Try role playing some of the things the BFG does such as taking phenomenal leaps. 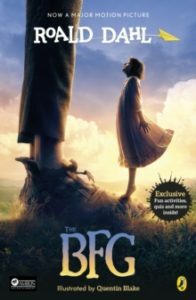 Take photos of your child dressed up as the BFG and choose a few to print out or share. for the BFG or a shopping list for the royal kitchen in case the BFG comes for breakfast at the Palace again. See our template here. How many other stories about giants can you think of? Read the Fantastic Mr Dahl by our patron Michael Rosen which looks at the ‘ingredients’ which make Dahl a fantastic writer for children.